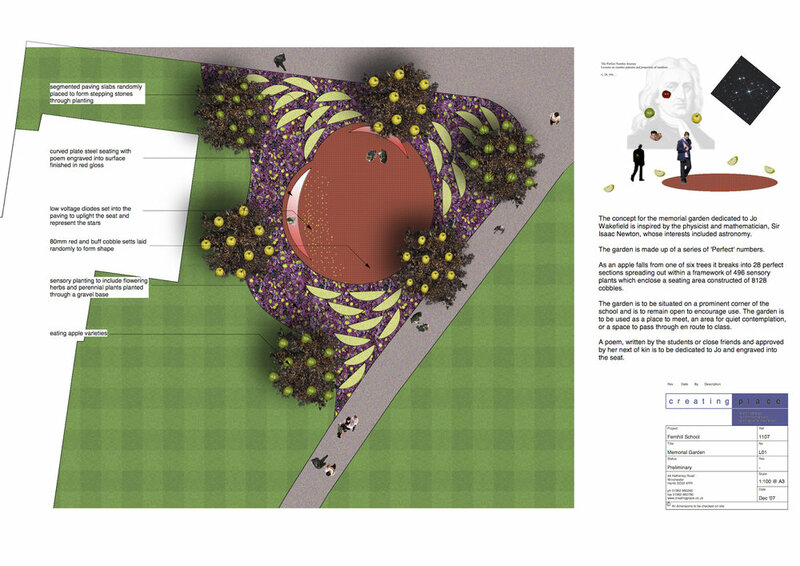 The concept for a memorial garden design dedicated to a popular maths teacher who passed away was inspired by the physicist and mathematician, Sir Isaac Newton. The garden, situated on a prominent corner within the school’s grounds is made up of a series of ‘Perfect’ numbers: As an apple falls from one of six trees it breaks into 28 perfect sections spreading out within a framework of 496 sensory plants enclosing a seating area constructed of 8128 cobbles. A poem, written by students and approved by the teacher’s next of kin was engraved into the curved timber seats.